It started with a welcome, a frequency number and a track by the Rolling Stones (Not Fade Away). Radio Caroline launched 50 years ago from a ship moored off the Essex coast. But while much is known of the DJs who became household names, what of the man who put the station on air? "There are not many people in Sweden who can tell their grandchildren that they were a pirate." Ove Sjöström, now in his 70s, is one of the few who can. It was Mr Sjöström who got Radio Caroline ready and who, on Easter Sunday 1964, pressed the button to broadcast. Radio Caroline was an offshore unlicensed radio station which helped pave the way for modern commercial radio. Transmitting from international waters, Radio Caroline only became formally illegal in 1967. And with one flick of a finger, Mr Sjöström altered - or perhaps set - the course of UK radio history. His involvement with the station began when Ronan O'Rahilly, the founder of Radio Caroline, visited Sweden to see Radio Nord, a Swedish offshore commercial station anchored in waters off Stockholm. O'Rahilly learned of a talented young engineer who had done work on Nord. That man was Mr Sjöström, who was in Liberia when O'Rahilly had visited. BBC Essex presenter Ray Clark says he has Radio Caroline to thank for starting his radio career. His book Radio Caroline: The True Story of The Boat That Rocked was published last month. "It was a great adventure, it was like being at primary school," he said. "We were a whole load of people in the same boat 18 miles off the coast all relying on each other. We all had completely different backgrounds, yet we all got on extremely well. "We were quite literally all in the same boat. "We did it because we believed in what Caroline was doing. We wanted to play records on the radio. Did it hurt anybody? No." Like Mr Sjöström, Mr Clark also tells his grandchildren he was "once a pirate". Before Mr Sjöström left for Africa, he gave Alan Crawford "a lot of advice" for his project Radio Atlanta - Caroline's rival - but, he says, he was never paid. On his return to Sweden from Liberia, his mother, who did not speak a word of English, told him of a strange call from a foreigner. The caller in question was Mr O'Rahilly. Mr Sjöström said: "Ronan and I got on well from the start. He asked me if I could come over and help start up a pirate radio ship. And I said 'of course'." He first laid eyes on the Caroline ship - the 702-tonne former Danish passenger ferry Fredericia - when he arrived in Ireland. "I had to start from the beginning. We started to put in the transmitters and all the necessary things. The pieces came in and we put it together," he said. While in the Irish port of Greenore, the Caroline team carried out a test transmission. "I mean we had to be sure everything was working," he said. "It blocked out television reception. And you could see on the harbour lights that the lamps were blinking to the music. You could see the music in the lamps. "I think we did it for a couple of nights." The plan, he said, was always to station the ship off the Essex coast. He said: "One thing I never told anybody, when Atlanta came to about a kilometre away me and some other Swedes took out a lifeboat to Atlanta and told the crew there that we had been working on that ship. "They said to come aboard. What I did, because I was quite sore at Crawford and Atlanta, I went down to the transmitter room and cut off a couple of things so they would blow up the tubes. "That's why they didn't come on the air and that's why Radio Caroline didn't have to bother about the competition. That was my revenge." When the moment came to turn on the Radio Caroline transmitter there were "many people around". The big switch on - which happened on a calm sea - is a moment Mr Sjöström no longer remembers. "There was a big switch to operate the transmitters," he said. "I have a faint memory, but I'm not sure. "I was down in the transmitter room the whole time." After the switch-on, he walked around tentatively looking for sparks or signs of any problems. He remained with Caroline for nearly two years, working two months on the ship, one month at home in Sweden. His time with Caroline ended when his wife fell pregnant. 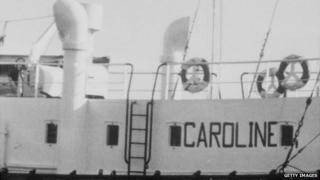 Although no longer an offshore radio station, Radio Caroline continues to broadcast via satellite and over the internet. Asked whether he appreciated his own role in getting Radio Caroline on the airwaves, Mr Sjöström, who now splits his time between Sweden and the Caribbean, said: "Oh yes, and I loved it."